Dr. Wiley and other scientists worked diligently with members of the shipping industry in New England to change locations of shipping lanes to prevent ship strikes. This goal was not an easy one; it required years of data collection and interpretation. Scientists considered data sets such as sighting and distribution data that indicated where whales were most likely to occur. Another consideration was sediment type. Humpback whales, for example, feed primarily over sand because they prey on a small fish which lives in the sand. The scientists also developed a current model to predict the locations of copepods, the favorite prey of North Atlantic right whales. When considering these data sets, they noticed that some of the locations of sandy bottoms, high copepod concentrations, and above-average whale sightings were smack in the middle of shipping lanes. Once they had all the data, they approached the shipping community to collaboratively decide locations to which the shipping lanes could be moved. The lanes were moved to locations with a mud and gravel bottom that was not copepod-heavy, and only took large ships a few minutes out of their way. 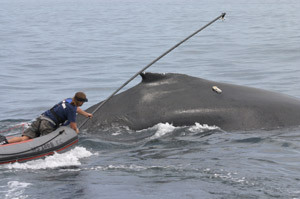 This shows a DTAG being placed on the back of a humpback whale. DTAG is the small white object that can be seen on the whale. Photo taken under research permit # 605-1904 issued by the National Marine Fisheries Service. In addition to being susceptible to ship strikes, whales are also affected by noise produced by ships. Therefore, Stellwagen scientists are also studying underwater noise. Using underwater listening devices called hydrophones, scientists can record underwater noise and discover the places and times at which there is a lot of noise. They are making connections between the noise and shipping, and how they can interfere with whales' communication. Dr. Wiley explains that, "We know that whales call for a reason, maybe to let other whales know where they are or the location of food. If they can no longer hear each other make these calls, that is a problem." Data collected in the sanctuary suggest that ocean noise has reduced the communication space for right whales by ~80%. ... "The evidence points to the acoustic space of whales being severely diminished by human made noise in the ocean," notes Dr. Wiley, "we have a number of ongoing projects, each of which is designed to provide data for the others." 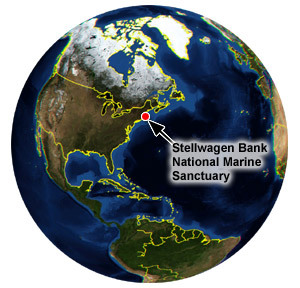 Another important project at the Stellwagen Bank National Marine Sanctuary uses specialized tags that indicate the types of behaviors in which whales are engaging. While satellite tagging is incredibly interesting and important, these tags give specialized data on a much finer scale. A tag will indicate a whale's pitch, or front to back movement, roll, side to side movement, heading, its direction, as well as depth. It also records every sound that the whale makes and that the whale hears. Using all of these data, scientists can create tracks that indicate every move an animal makes using special software created for the express purpose of studying whale behavior. This is a great example of scientists, technologists, and engineers working together to study a problem, and hopefully, to find a solution. This is a 3-dimensional map of the movements of a humpback whale feeding along the ocean bottom over a period of several hours. DTAG derived data were visualized and analyzed using Trackplot, a custom software application. 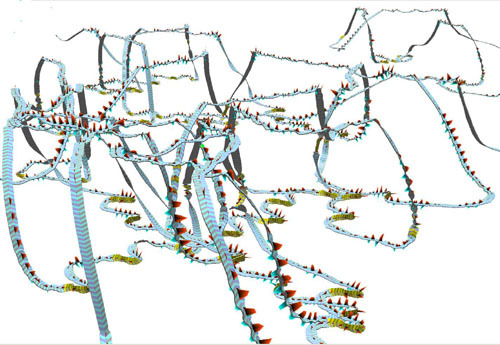 Trackplot creates a ribbon that represents the temporally accurate, 3D swim path of the tagged whale. In scale, the ribbon is two meters wide (the approximate width of a humpback whale). Chevrons on the ribbon's top surface reveal travel direction and segment the ribbon into 1-second time intervals. Loops, turns and rolls in the ribbon correspond to the same orientations in the DTAG and, therefore, the whale. Body roll greater than 40 degrees are color coded yellow. This animal is repeatedly diving to the bottom and rolling on its side to capture sandlance fish. This behavior makes humpback whales vulnerable to gillnets and other fishing gear that is fished along the seabed.